Members of the Presidential Task Force on the ECOWAS Single Currency Program on Wednesday reaffirmed their political will to introduce a single currency in the West African region by 2020. 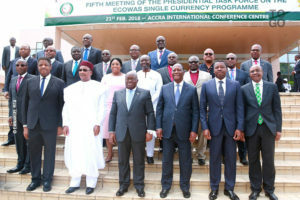 In a Communiqué issued at the end of the 5th Presidential Task Force meeting in Ghana, the leaders of the regional bloc reaffirmed their commitment to ratify and implement all relevant ECOWAS Protocols and Conventions, as well as the gradual approach where member states, which meet the convergence criteria, can start the monetary union. The Accra meeting reviewed the progress made by the Task Force, co-chaired by Presidents Akufo-Addo of Ghana and Issoufou Mamadou of Niger, on the roadmap to attain the single currency for the region by 2020. In his opening address, Ghana President Akufo-Addo urged ECOWAS member states to renew their commitment to the ratification and implementation of the relevant ECOWAS protocols including protocols of the free movement of persons, goods and services, the ECOWAS trade liberalization scheme and the Common External Tariff (CET). Nana Akufo-Addo stated that with the growing population of the sub-region, it will be prudent to implement the common currency to enhance trading among ECOWAS member states. The decision to create a single monetary zone for West Africa was reached by the heads of state of ECOWAS in Lome, Togo, in 1999. The first deadline for the full implementation of the common currency for West Africa’s Anglophone countries was set for 2003. That could not be met. And subsequent deadlines of 2005, 2009 and 2015 could not be met either. Posted by Emmanuel Agbenonwossi on February 22, 2018. Filed under Finance, News, Zoom. You can follow any responses to this entry through the RSS 2.0. Both comments and pings are currently closed.